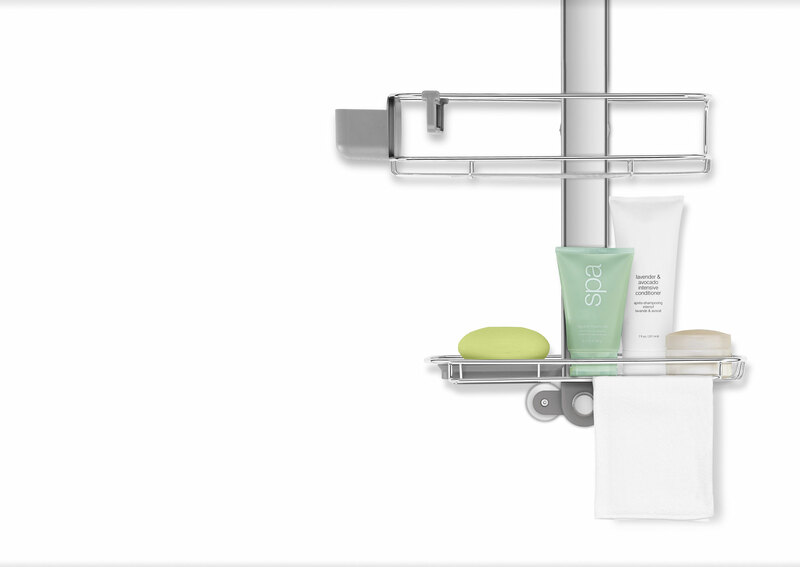 Our adjustable shower caddy makes room for tall bottles with its unique, adjustable shelves that slide up, down, left and right. 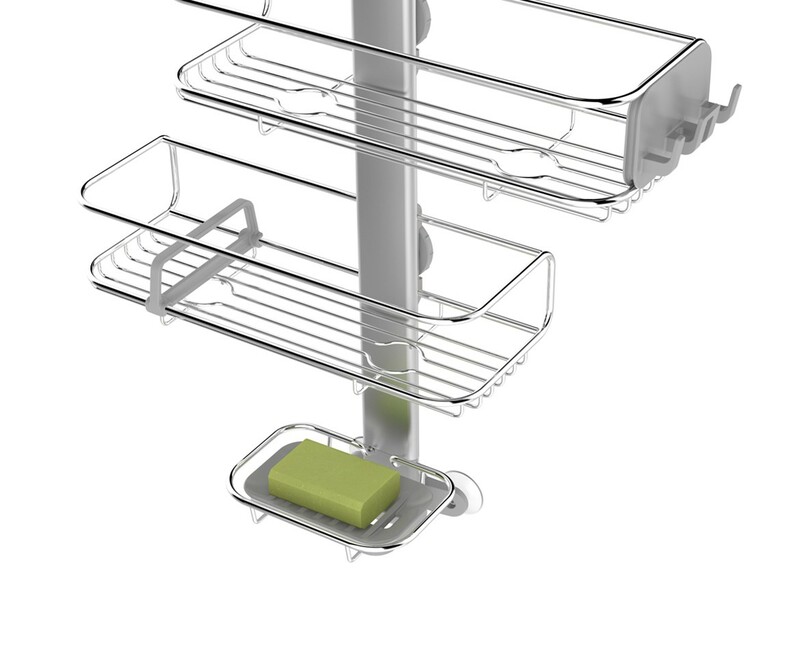 The stainless steel wire shelves are corrosion-resistant. A rubberised showerhead clamp and pivoting suction cup ensure a secure, hassle-free installation. Very happy with this shower caddy. Fits perfectly and looks great in our bathroom. Great quality product, too - probably the best over many years of having owned different types of caddies. Thank you! Lovely but it doesn't fit! This is a lovely good quality product but unfortunately I could not use it because the fixing was too small which was such a shame. I did a lot of research and this was the perfect one I wanted. I rang the company to see if they had any larger sizes but they didn't. 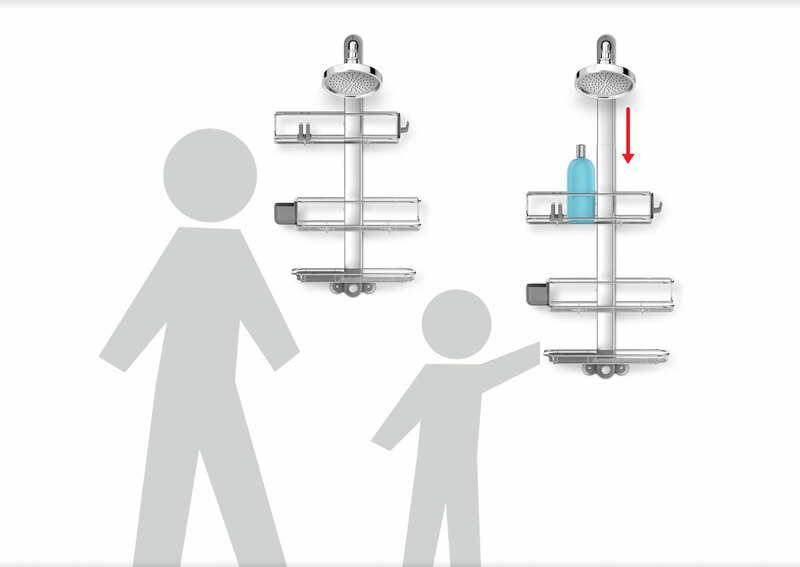 Not every shower are the same size, it should have an adjustable fixing components. I had to send I back and I am still looking for a similar product. QUICK shipping. Very well made. VERY pleased with product. Very happy with the product but although it says for pipes up to 1" in diameter, the rubber seal makes it almost impossible to fit on 1"pipe. It is difficult to get the leverage to close the neck fitting around the pipe (specially where the pipe is near the ceiling as our is). I had to find a longer screw and leave the neck slightly open. But it does the job. I'm hoping it won't rust over time. The only shower caddy that does not rust! I have just bought this caddy as a replacement for one I bought from Simplehuman 7 or more years ago. I had spent money or cheap caddies that rusted in months. Even after 7+ years this product had not rusted. The only reason I had to replace it was because I took it down to be cleaned, dropped it in the bath and broke the securing bracket at the top! Best value for money! I love this, it's adjustable so you can make all of your items fit. It hasn't rusted and it isn't cheap looking at all. Plenty of storage and my favorite part is the soap holder. Soap is right in front of you and you can remove the soap tray to clean it. The product is all it is promised to be and I love the fact that it won't rust! I look forward to enjoying it for many years! Your shower caddie is brilliant. Just a few suggestions. If you designed and sold different heads to go with the caddie you would sell hundreds more.1:- head that fits over a shower cubic. 2:- head that can screw to the wall or tile. It also rocks a little from side to side. A couple of clear rubber feet would stop this an make it more secure. Finally I wanted to purchase a second razor holder for the other side but you don't sell these as a spare part. This is a well-made and simple to use product and keeps your products organized. It provides what it was intended to - organization and simplicity. It's exactly what I was expecting: Versatile, well-built, and attractive. A bonus is how snugly the top attachment fits around the shower nozzle. That, combined with the suction cups keeps it very stable. We have this in our guest shower, as our master bath doesn't need one. I've used this for a couple of months now. I like its design much better than the standard ones found in box stores. This has more shelf space which accommodates both my husband's and my needs for showering products. The soap holder is not affected by the water at all & dries the soap between showers which I like. It hangs securely in place, never slipping forward and launching all my products on the shower floor like the standard design did. More expensive, yes, but it functions better, holds more AND looks better. No regrets. Does just what it's supposed to do. Holds much more and is much less annoying than those cheaper products that just hook over the shower head. I bought this as a gift for my now fiancé. When we got it we had to order new suction cups as the ones sent with the unit were defective. It is supposed to be a premium product but she just pointed out to me yesterday that the wire shelves have started to develop rust. I'm not sure how it is possible since it's supposed to be 100% SS and aluminum but it is developing rust spots. I'm very disappointed. Now I'll have to take pictures and mail it back... huge hassle, huge disappointment. Thank you for your feedback. We are so sorry to hear this. It sounds like the baskets are faulty, as they should not be rusting. A customer support representative has contacted you to provide further assistance. Good product and design. You also could have given 3 shelves options ( for little more price) a suggestion ! Very easy to use and very flexible. Keeps items clean and neat. Highly recommend. Everything we have purchased from Simplehuman have fit our needs to the tee! We LOVE our new shower caddy and it's space saving design!! Thanks also for the "beyond reasonable" cost!! 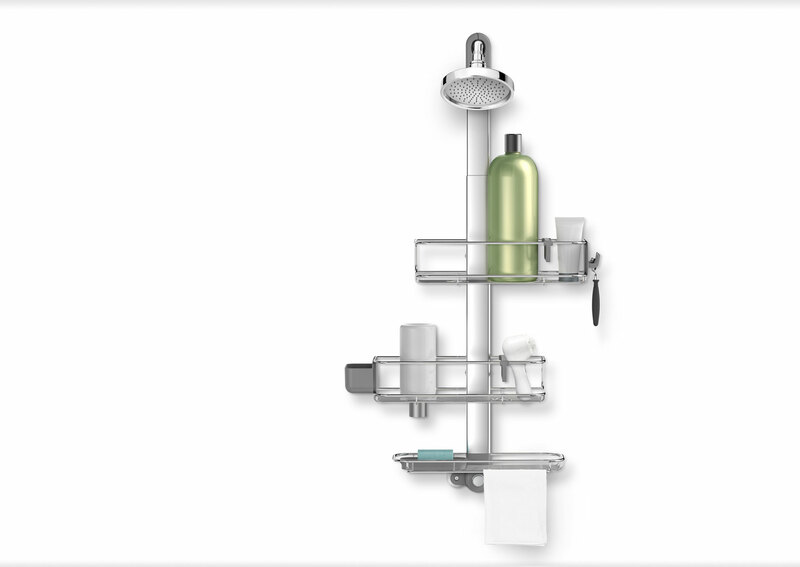 The Simple Human shower caddy is just the right size for what we were looking for. Functionality is superb, clean simple lines are beautiful. We love our Caddy and it's a great organizer for everyone. I am very happy this is stainless steel that won't rust. I am happy with the adjustable design. It nice that the adjustable design allows me to adjust it for taller bottles. I like the design of the connector above the shower head. It doesn not slide down. That is good. I actually popped the plastic hooks out of the top rack and put it in the bottom rack. There are two things I would change if I could to suit me. One is I would make the plastic hooks interchangeable to allow me to put it on either side and rack . 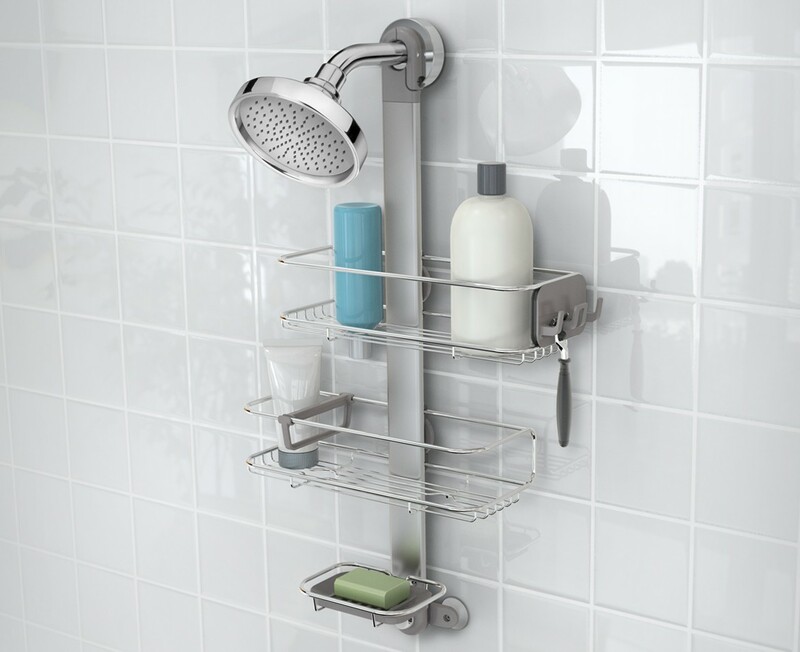 The second thing I would change is I would put the soap dish above the top rack.behimd the shower head so the water doesn't run on it and desolve it. . Simple Human products are always of the best quality, and this is no exception. The adjustable shower caddy holds everything one could possibly need or imagine, including my bar of soap. When showering, I hate the fact that my soap gets drenched and disappears much sooner than its time. With the shower caddy, the soap is up and out of the way of the shower spray. It holds all of my shampoos, conditioners, razor, washcloth, and even those items that can't stand on their own. Simple Human has cleverly designed a piece that holds these items that don't have a flat bottom. This is a must for every shower. Really good but one drawback. Overall I really like the caddy. It has several handy features such as the securing devices and the adjustability features. The only drawback is with the hooks. I wanted to switch them from the right to the left side of the unit. I got it detached but could not get it to fit on the left side and the hook base broke when I tried to reattach it. I wish I had read the reviews of this product before purchasing. The suction cups don't stick to anything, making it no where close to worth the money. It works no better than the one I bought for $15 at Target. I bought a very similar, slightly older model of this caddy, a little less than a year ago from Bed Bath and Beyond. Worked great for a while, and tossed the receipt. In the past few months, the unit developed major rust problems. I was about to buy a new one - from a different manufacturer - when it occured to me to reach out to simplehuman to see how well their warranty program worked. Well that experience was top notch. Even without a receipt, they coordinated an exchange for a brand new model, at no cost to me. I wound up buying a new one from them directly, with free shipping to me. Then I returned the old rusty one to them in the same box, with another free shipping label. Once they received the old one, they refunded me the price I paid for the new one. Really great customer service and definitely helped me give this company another shot. Hopefully this new one doesn't rust. Nice quality like the rest of the Simplehuman products we've ordered. My only complaint would be the cheap suction cups that came with it. They are thin and flimsy, warped out of shape, and won't stick to anything. Thank you for your feedback. A customer support representative has reached out to further assist you. I already own 2 simplehuman items (garbage pails), use simplehuman liners, and am very satisfied. 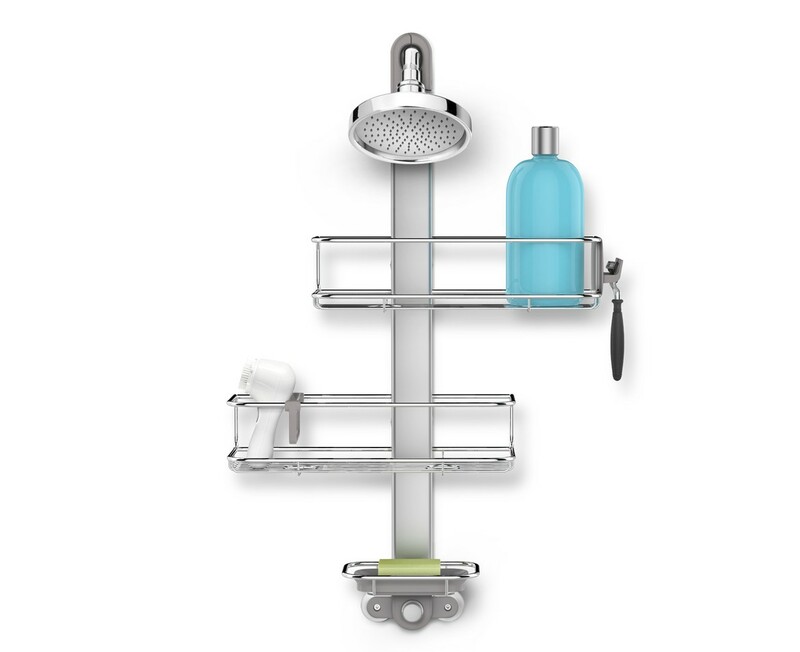 I ordered the shower caddy on the basis of its sleek, elegant design, received as e-mail. When it arrived, the engineering was up to the design. The single problem was the size of the hook. It is engineered quite precisely to fit over the showerhead pipe. However, I wanted to hang the caddy, not from the showerhead pipe, but from the shower-curtain rod. The hook did not fit: the rod is wider than the pipe. I returned the caddy regretfully.